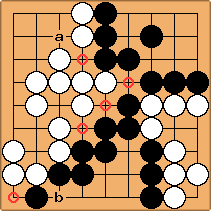 Dame are points on the goban which do not give any points to either player. Normally, dame are filled in at the end of the game by alternation between the players. Sometimes the word is used more dynamically, such as 'with this play, Black has made the lower edge dame' - meaning that because of the way Black has played, the lower edge (which we suppose was strongly influenced by White) will now likely not give (m)any points to either player - a net benefit for Black. Note that although a dame is not a territorial point, the exercise of filling them in often obliges a player to add a stone inside his own territory. The circled points are dame. Note that White will be forced to protect the cut at a and Black will have to play at b sooner or later. The original Japanese meaning of dame is 'liberty'. Thus, a dame point is a point which is (nothing more than) a liberty of some stones. Your diagram is incorrect - the circled point closest to a is not a dame, but a real point. If White plays it, she will not have to fill in at a; if Black does, she will. Thus, this is worth a point under Japanese Counting, and thus it is not a dame. The situation regarding Black b is best understood by saying that 'b' itself is a dame point as well - it is not a point of territory, but it is also not a point where points can be made or lost. I agree with your comments - you put it more succinctly than I did. I was trying to say that the dame themselves do not become points - however playing them may change the actual score - and this is what I tried to show with the diagram. However, I still thought that e.g. the 'dame' close to a would be called a 'dame', although, as you say, playing it makes a 1 point difference? Although a dame itself does not become a point, there can still be sente dame (e.g. the first stone cutting a bamboo joint) or, like in the example above, one-point dame. Or would they then no longer be called a dame ? By the way. We may want to actually WikiMasterEdit a page like this, so that it becomes more 'consistent'. There certainly are sente dame. You mention the not-working cut, and the point in the lower left is dame too. However, these moves differ from the one near a in your diagram. Even though a sente dame is sente, it does not gain points to play it. The result of playing a sente dame is the same as the result of passing (under territory counting) or of playing a gote dame (under area counting). As for doing a WikiMasterEdit - I am all for it, and am willing to do so. I just wanted to first tell things this way before I start changing something in your text. I've added some more thoughts to WikiMasterEdit as for the when/who - see if you agree.